The cell. 8. Cell cycle. G1 phase. Atlas of plant and animal histology. The cell 8. Cell cycle. G1 phase begins with the birth of the cell and ends when DNA replication starts (S phase). During G1 phase, proliferating cells grow and get ready for replicating the DNA. Some cells quit the cell cycle during G1 phase and start differentiation, remain quiescent, start senescence, or die by apoptosis. The decision depends on the checkpoints, which are molecular complexes where cyclin dependent kinases are present (CdKs). The main checkpoint decides if the cell is ready for S phase or not. 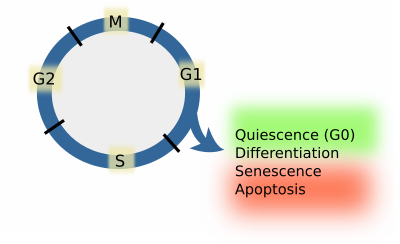 G1 phase spans from the end of mitosis to the start of S phase. During G1 phase, cells check if everything went correct during cell division, and then decide if they continue through the cell cycle or not. In multicellular organisms, the cell cycle progress is mainly influenced by extracellular signals, like cell adhesion, trophic factors, and mitotic promoters or inhibitors, all of them produced by other cells. There is also internal information about the state of the cell that affects the progress of the cell cycle, like proper content of organelles, correct number of chromosomes, etcetera. When external and internal signals are good, cells grow and get ready to enter S phase. However, most of the cells of multicellular organisms do not proliferate, but are arrested in the G1 phase of the cell cycle, either transiently or permanently. Stopping the cell cycle means that cells are going to differentiate, stay quiescent, go through senescence processes, or die by apoptosis. When cells remain in a quiescent state, it is said that they are in G0 phase. From G0 and differentiated states, some cell types are able to restart the cell cycle. These are four possible decisions that cells may take during G1 phase, which are actually molecular complexes known as checkpoints. Cells must pass these checkpoints for entering in S phase. If cells do not pass one of them, it is said that a decision has been taken. However, If cells do not stop in any of them, S phase will eventually start. This is the default process. Decisions that a cell may take during G1 phase (modified from Blomen and Boonstra, 2007). Checkpoints, which control the progress of the cell cycle, rely on cyclin dependent kinases (CdKs). For being active, these enzymes need binding a regulatory protein known as cyclin and be phosphorylated as well. Nine different CdKs have been found. Once activated, CdKs phosphorylate several substrates such as inhibitors of the cell cycle, thus allowing the progress of the cell cycle. Cyclins are proteins synthesized periodically during the cell cycle. There are 16 different cyclins in eukaryotic cells. Cyclins A, B, D, and E have more impact in the progress of the cell cycle. Cyclins D and E are important for G1 phase progress. CdK/cyclin D and CdK/Cyclin E phosphorylate the transcription factor retinoblastoma, which is part of the last checkpoint of the G1 phase. The checkpoint where retinoblastoma is phosphorylated is known as restriction point because, if this checkpoint is passed, cells immediately start the S phase. This is very important because, once S phase is started, cells continue through S, G2 phases and finally divide during M phase. Important molecules of this checkpoint are CdK-cyclin, retinoblastoma and E2F. Retinoblastoma arrests the progress of the cell cycle by inhibiting the expression of the genes needed for the starting of the S phase. When retinoblastoma is phosphorylated by CdKs-cyclin, E2F is activated. E2F allows the expression of genes for DNA replication, and centrosome duplication (in animal cells). This molecular framework is influenced by other signals like food availability, trophic factors, temperature, integrity of DNA, size of the cell, etcetera. If everything is OK, this restriction point is passed and S phase S starts. As mentioned above, most of the cells of adult organisms are not in a proliferating state. This is because the inhibitors of the CdK-cyclins are acting in the G1 phase. There is another kind of inhibitors that stop the cell cycle when it is dangerous to start DNA replication. p53 is a a transcription factor and one such inhibitors. When DNA is damaged, or the cell is under stress, or there are changes in the pH, or others potentially dangerous situations for the cell are present, p53 is over-expressed and activates the p21 gen, which in turn inhibits the phosphorylation of retinoblastoma, so that the cell cycle is arrested and does not start the S phase.